Perfect for Halloween and fans of Horror. 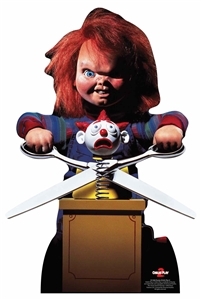 Charles Lee "Chucky" Ray is a fictional character and the main antagonist of the Child's Play slasher film series. Chucky is portrayed as a notorious serial killer whose spirit inhabits a "Good Guys" doll and continuously tries to transfer his soul from the doll to a human body.